UNITED NATIONS, August 30 -- Faced with a recommendation that the Inter-governmental Panel on Climate Change finally institute financial disclosure of conflicts of interest, IPCC chairman Rajendra Pachauri belatedly told the Press on Monday that he now supports such disclosure, which he had resisted for months. 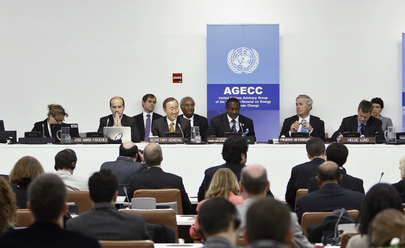 The report of the InterAcademy Council, delivered Monday to UN Secretary General Ban Ki-moon, notes Pachauri's “service as an adviser to, and board member for, for-profit energy companies.” Beyond those, Inner City Press had asked Pachauri and Ban Ki-moon about how much Credit Suisse, Deutsche Bank and others were paying for Pachauri's services, to whom and for what -- neither provided answers. On Monday, Inner City Press asked IAC chairman Harold Shapiro about the recommendation, why it alludes to “confidential” financial reports and discussions, and what benefit there could be to the IPCC for it chairman to be working part time for profit making companies. Video here, from Minute 26:21. Shapiro, saying it is a serious question not yet sufficiently thought through, noted that the first issue is who would administer the disclosures, and decide who to exclude on conflict grounds. He added that while not explicitly addressed in the report, the Council's thinking what that a strengthened Executive Director should be responsible. Pachauri himself, accompanied by the IPCC Secretary and others, immediately held a press conference to put their spin on the IAC report. 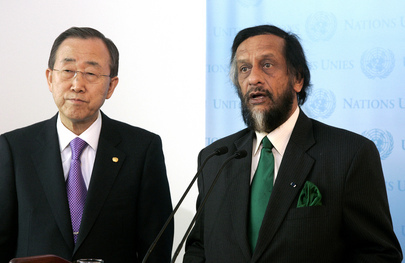 Pachauri claimed to have already been moving to strengthen the IPCC Secretariat. Inner City Press asked about the IAC's proposal on disclosure of conflict of interests. Video here, from Minute 15:47. Pachauri said he agreed -- a bit strange, since he has been resisting disclosure for months. In fact, while Inner City Press asked him again Monday to describe the work he did for Credit Suisse and Deutsche Bank and how much they paid, and to whom, Pachauri did not answer this. Video here, from Minute 22. Rather, he pointed at an apology by the UK Telegraph, for their statement that Pachauri personally made millions. Pachauri said that the reporting had been entirely “discredited.” Inner City Press pointed out that the reporter asserted the apology was giving in to the “blackmail” of litigation threats. “The legal system is something designed to give fair judgments,” Pachauri replied, arguing that the apology discredited all of the reporting. Ever heard of libel tourism to the UK? The key here is not whether Pachauri directly took the money from the corporations, but why he resisted disclosure, and whether it serves the IPCC for the chair to have outside corporate work. Neither Shapiro nor Pachauri could articulate any benefit. 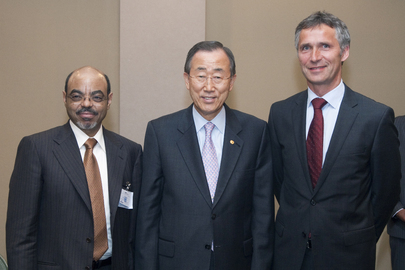 Inner City Press asked Ban Ki-moon's spokesman Martin Nesirky later on Monday, but he said Ban had not yet read the report. Watch this site.